Planning meals in advance can take the stress out of cooking. Improvisation and spontaneity at mealtime are wonderful in theory, but quickly lose their charm when you're tired and hungry, the kids are squalling, and the contents of the cupboard offer no inspiration. Investing a few hours over the course of a year to create monthly meal plans can save time, money and stress; and at the same time make it easy for you and your family to eat healthier food every day. There are as many reasons for meal planning as there are families, but most planners have a few shared motivations. For some it's about saving money on the groceries by strategic purchases of bulk or seasonal items. For others the benefit is stress reduction, knowing in advance what to cook and what ingredients are on hand. 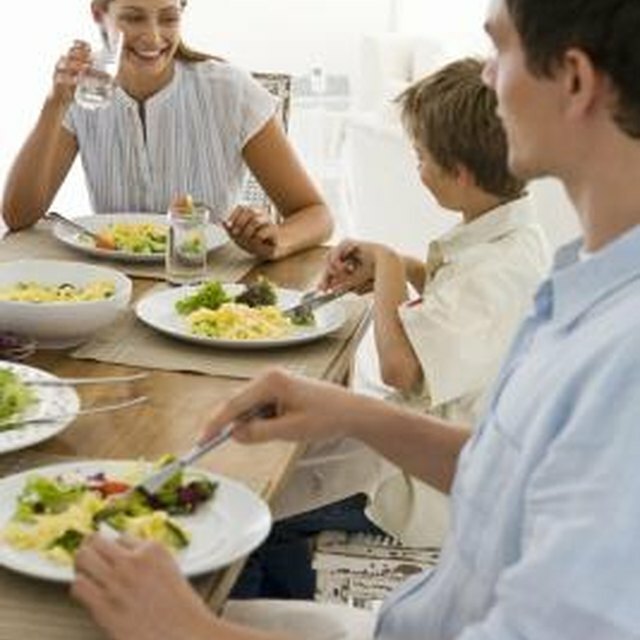 Meal planning also gives each cook active control over the family's diet, helping ensure better nutritional choices. This is especially important for those with special dietary needs, such as diabetics or vegetarians, or those looking to lose weight and improve their health. Begin by making a list of favorite meals or recipes you use regularly, then a second list of things you'd like to serve more often. Using these two lists, fill in a blank calendar with your first month's menu. Remember to allow for periodic leftovers: Sunday's baked ham can become Tuesday's casserole, for example. Make up a master list of ingredients you'll need for the recipes, and use that to create your shopping list. If you're planning meals to fill your freezer, remember to buy freezer bags or containers as well. Shop each week with your master ingredients list in your hand, for both the current and the next week. If there's a good sale on a nonperishable you'll need later, get it now. Be flexible where possible: if a recipe calls for collards and you find chard or kale on sale, make the substitution. Review your plan nightly, and thaw any ingredients you'll need the next day. Some recipes require preparation the day before, so mark those with an asterisk. Keep vegetables and dip on hand for healthy snacks between meals, or to quiet the kids while dinner's under way. 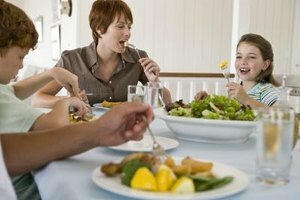 Moving from unplanned dinners to planned dinners is a significant lifestyle change, and you'll probably need to modify your system as you go. Review the plan mid-month, and ask yourself what's working for you and what isn't. Incorporate any necessary changes as you plan the next month's schedule, ideally around the middle of the current month. You might want to leave one night each week unplanned, or keep one or two well-loved meals frozen for days when life happens and you're unable to cook as you had planned. The goal is to simplify your life, so be as flexible as you need to. For regular family meals, there is an abundance of cookbooks and websites filled with recipes and suggested menus. For those with special dietary needs, such as diabetics, celiacs or vegetarians, a professionally prepared meal plan can be a valuable aid in learning a new way of eating. Sample plans are often available through the official association for a disease or disorder, or through online forums and local support groups. Your family doctor can also suggest resources in your area, for this kind of major change in your eating habits. 30-Day Gourmet: Freezer Cooking Tips & Techniques"